World population is projected to increase drastically in the coming decades which might bring about shortage of food. Freshwater fish are considered to be one of the most promising commodities that can contribute to increased food production in a sustainable manner. Common in the Asia-Pacific region, freshwater aquaculture provides diverse benefits to rural farmers including income generation, improved nutrition and sustainable livelihoods through integrated farming system. The main objective of this symposium was to provide a venue for information sharing on extension of small-scale aquaculture, specifically targeted to those individuals and relevant organisations involved in various aquaculture development projects. The symposium also assessed and presented the effectiveness of “farmer-to-farmer extension” approaches in the implementation of relevant aquaculture development projects in the region. The symposium was organised by the Japan International Cooperation Agency (JICA), NACA and the Thai Department of Fisheries for stakeholders involved in the JICA-assisted projects in Cambodia, Lao PDR, Myanmar, Benin and Madagascar. The symposium was also attended by representatives from other countries in Asia and Africa including Cote d’ Ivoire, Indonesia, Malaysia, Nepal, Philippines and Zambia. Small aquaculture farm holders are experiencing some drastic changes, the shift from household consumption focused subsistent production to market oriented commercial production and external environment changes such as tightening governance on environment impacts control and resource allocation and increasingly stringent standard for food safety and quality. To adapt to the changes, the small-scale farmers need to intensify, diversify and commercialise production, which requires better management. 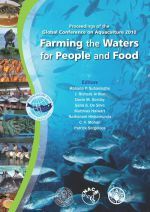 Practices and people can be considered as two key ingredients to responsible aquaculture. Practices that are in conformity with national and international standards and requirements, ensure sustainability of the sector, ensure environment protection and integrity, enable social equity and respect ethical values and standards, consider human food safety concerns seriously and people who; are well informed, willing to change and ready to embrace practices for public good. The Aquaculture Department of the Southeast Asian Fisheries Development Center has been promoting a number of programs towards effective dissemination and adoption of science-based aquaculture technologies for rural aquaculture development. This is in line with the national government development program on sustainable aquaculture, which is implemented in agreement with the country’s Fisheries Code of 1998 and Local Government Code of 1991. In 2001, the Southeast Asian Fisheries Development Center and Department of Fisheries in Thailand conducted acollaborative pilot project on coastal fishery resources management with the cooperation of local fishing communities and other stakeholders, community groups and local administrative authorities in Chumphon Province. The project established a practical framework for locally-based coastal resource management by encouraging fishermen’s participation supported by the creation of alternative job opportunities in coastal fishing communities. Presentation on the experience of the Asian Institute of Technology in small-scale aquaculture development. Aquaculture could be a solution to increase the nutrition available as well as to provide additional income source to local farmers, as it is known that the potential demand for small-scale aquaculture using paddy fields, canals and ponds is very high. However, many rural communities have little experience with fish culture. In addition, there are local shortages of the required raw materials for farmers to practice fish culture. PROVAC aims to increase fish farmers in the target seven provinces of the Southern Benin by using the extension approach so-called “farmer-to-farmer” training. In this approach, the Project supports establishment of core farmers who can produce seeds and homemade feeds. The core farmers then offer technical training for ordinary farmers in cooperation with extension officers at the facilities of core farmers. PROVAC has achieved various technical improvements including in seed production. An FAO project ignited a first practice of freshwater carp aquaculture in highlands of Madagascar in the late 1980’s. Since then, carp culture has been practiced in the area but the number of farms at present are only few. In terms of tilapia culture, the Rural Development Support Project in Madagascar financed by the World Bank promoted tilapia culture for small-scale farmers in the district of Marovoay from 2002 to 2004. Fish is one of the most important foods for the Myanmar people since more than 70% of animal protein is taken from fishery products. It has been reported that people in the rural areas, particularly those who live far from the main river systems suffer from a deficiency of animal protein due to insufficient supply of fish. The majority of those are needy farmers and they depend only on crop cultivation for their livelihoods.